REDDING, Calif. - Simpson University is pleased to announce the hiring of Alex Mathias as its new head of soccer programs. He will oversee the university’s men’s and women’s soccer teams. Mathias, a native of Rio de Janeiro, Brazil, is the self-proprietor of an international soccer training, coaching and recruiting business in Los Angeles called Eleven Sport USA and serves as the technical director of two Brazil-based soccer teams. Mathias has experience as a program coordinator and director. 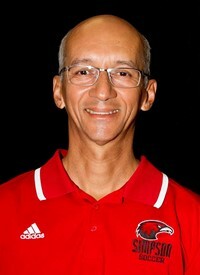 He was the coordinator of soccer programs at the Brazilian Soccer Institute in San Paulo and Rio from 2005-2014 and also coordinated international programs for the Brazilian Soccer School and its affiliation with the Brazilian Soccer Confederation from 2009-2010. He was the program director for Rio’s Flamengo and Vasco Clubs. Mathias’ coaching experience includes being the goalkeepers coach in 2014 and 2015 at the Fuerza FC (USA) in the Seattle metro area and the head coach of Vitoria de Santo Antao professional soccer club in Pernambuco, Brazil. Mathias and his wife, Christiane, live in Redding.